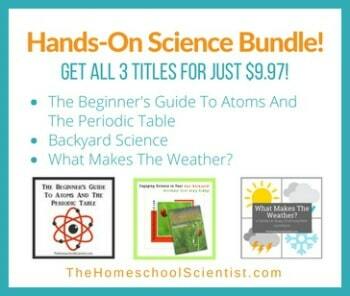 As soon as The Homeschool Scientist posts the free monthly calendar we check out what science experiments we want to try. We read an interesting article about the first test. A crater from which all vegetation had vanished, with a diameter of 1200 feet and a slight slope toward the center, was formed. In the center was a shallow bowl 130 feet in diameter and 6 feet in depth. The material within the crater was deeply pulverized dirt. The material within the outer circle is greenish and can be distinctly seen from as much as 5 miles away. The steel from the tower was evaporated. 1500 feet away there was a four-inch iron pipe 16 feet high set in concrete and strongly guyed. It disappeared completely. Since Radioactive material in small quantities was located as much as 120 miles away, we checked to see how many miles from New Mexico we live. Thankfully over a few thousand miles. With all the bomb excitement, we decided to make a few safer “bombs” of our own! Water Bombs – water bombs are safe and easy water play. Especially safe for little ones. Simply cut sponges in half, and then in half again. Twist tie or rubber band sponge pieces at their center together. Paint Bombs – art has never been more fun. Follow our step by step directions how to make them because it’s a trick getting the paint into the water balloons. Bath Bombs – boys need to smell good after a long day of explosions. Explode your bath time with this recipe. Exploding Soda – who doesn’t love a good Mentos YouTube Video? This dad even makes a Mentos exploding rocket! Exploding Bag – we love the erupting volcano experiment, but it’s gotten a bit old. I found these instructions to make the same experiment a little more exciting! However, only 1 of our 4 bags actually “exploded”. After a lot of frustrated shaking on my part. I might have been the brand – baking soda was not Arm & Hammer. (after the experiment I was told the words “explode” and “pop” are not the same). If you don’t want to get your hands dirty, or wet, you can always have your children paint the famous atomic bomb mushroom! Chalk pastels or water colors work great. Enjoy exploding history and science today! Stef Layton is a homeschool mom to two energetic boys. She believes in hands-on interest-led learning. Married to a busy traveling golf course architect, they have taken their homeschool on the road. You can find Stef blogging and creating brick building ebooks with her son. Stef is a regular contributing writer for The Homeschool Scientist and Homeschooling Today Magazine. Wonderful article and thank you so much for the information! I will have to try this with my kids. But I did want to correct you. My husband was a scientist at Los Alamos National Lab and he worked there for 8yrs. During that time we not only lived there, we lived in the history of that small town nestled in the hills of northern New Mexico,. The atomic bomb was created there, but the Trinity Test site was the location of the first test sight, which is located in White Sands NM in southern NM, over 200 miles away. It is referred to as White Sands Missile Range. The public is still not able to go to that location. Occasionally scientist from the lab can tour that area. It is not to say there is not radioactive material in the air in Los Alamos, but believe it or not they monitor things like that (crazy, right!). Thanks again for sharing these experiments! I know the kids (and even probably my husband) will love it! Thanks for the info, Jennifer. Enjoy the experiments! These sound so fun for summertime! Thanks for posting! The paint bomb link doesn’t appear to be working. And is there something missing from the water bomb instructions?